Wow…..get in the pool guys as soon as you can, post surgery! So my personal trainer at the gym encouraged me to try and walk up and down the pool a few times to see how it went. It’s chest high, same depth all the way, 20m long. When you’re at the stage where you’re just starting to walk in shoes, you’ll probably find it really difficult and hobble pretty badly but to the lack of stretch in your achilles. You’ll get loads of exercises given to your by your PT but they’re pretty dull and not that rewarding in the early days. Get in the pool and everything changes. For the first length I was nervous and still hobbling but once I relaxed I was walking totally normally. Full stretch, heel down first, step after step. It felt incredible, a little sore of course but not painful. A really nice stretch feeling. Even when I got out of the pool my gait was so much bigger. Of course it stiffens up again but I’m in the pool everyday now and have even thrown in some swimming with a pull buoy (float between legs) so I don’t need to kick. Feels great to finally be doing some cardio work. In just 6 days my wife says my walking has improved immensely. I also saw my consultant yesterday and he doesn’t need to see me for another 3 months now which is great news at only 9 weeks. He says I’m ahead of schedule which is brilliant to hear, thanks to the accelerated protocol no doubt, and just need to keep up what I’m doing. He did though recommend buying a pair of HOKA running shoes….I’d never heard of them but they have HUGE soles on them for ultra marathon runners. Naturally I don’t intend to run any ultra marathons any time soon but he said they are wonderful in aiding recovery of any calf/achilles/tendo injuries. Good advice….just on Amazon and take a look. I also brought up with him the two words that terrifies anyone with an achilles rupture….healing long. He made it very clear that it would take something incredible for me to heal long as I have had surgery. Healing long is only a potential issue with conservative care. This is good news as I’ve been a little tentative with any dorsiflexion movements as I have those two words in my head, but not any more. In his 20 years as a consultant he has never had a surgical repair on achilles rupture result in healing long. Until next time, from London. Bye bye boot (8 weeks+3) and hello gym! Man I really hated that boot…never got on with it at all. I was hopeless at walking in it, never could get the whole rocking thing going depsite my physio trying to show me. So my leg was always out to the side….aagh the hip pain! Still, I’ve now ditched the boot and am hobbling around in a pair of running trainers constantly. Even round the house, trainers on ALL the time. Naturally I gave them a good clean first! I tried without the boot last week, exactly 8 weeks post op, it was actually totally fine but I kept using the boot when out of the house for a few days. If anything, it’s a clear sign to others to be wary of knocking in to you. My issue now is learning to walk again. At the moment when I walk I turn by bad foot (right) out to the side. This is BAD so avoid this if you can. I have the hip/groin pain to show for it. It’s very difficult to walk with my foot facing forwards as there is no stretch at all in the tendon yet so my leg doesn’t bend when I walk. So for now I’m kinda shuffling along. Bad foot forward, then good foot up along side, and repeat. It’s not exactly walking but that will have to do for now. Small victories…. In other news, I have joined a gym. This is major for me as I don’t think I have ever stepped foot in a gym before, literally. Sounds daft as I’m nearly 40 but I’ve always exercised outdoors (running, cricket, golf) with the occasional swim at my local pool. So turning up at my nearest gym to find out what all the fuss was about felt very odd, there are some machines in there I have literally no idea whether they are for exercise or chopping vegetables. I struck gold though, as the first personal trainer chap I spoke to (hello Ian) ruptured his achilles 5 years ago! You beauty! He’s going to show me all sorts of exercises I can do and help me through the next few weeks……I couldn’t believe my luck. His advice for first exercises, apart from static bike that i have at home, is to walk up and down the swimming pool. It doesn’t go beyond chest height so I can do entire lengths back and forth. I haven’t tried it yet but might give it a go tonight. I’m up to 12 minutes on my static bike now, 3 times a day. The leg gets a little sore towards the end so 12 minutes is fine for now. It’s a start…. So for the next few weeks it will be lots of pool work, bike at home and lots of physio exercises…..a little boring but patience is a good trait to have here. It’s only been a few days since my last post but I wanted to get this post in asap having read the comment from iasablan and ty620 who are both on a similar timeline to me. It’s quite a lengthy post this, but worth it, this will shave weeks off your recovery. I saw my surgeon on Saturday who is very experienced in ATRs and is involved in all sorts of studies on the matter and he talked me through a study which compared the results of loads of trials on the subject of post surgery treatment. 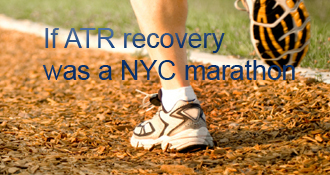 There have been lots of trials over the years that compare different types of treatment for ATRs. This study from 2014 put together all of those trials to try to come up with a definitive approach that led to a faster return to pre-rupture activity but also keep re-rupture rates low. So the trials covered groups that took the more ‘traditional’ approach of NWB for 2-3 weeks in a cast, then PWB for 4-6 weeks in the boot, then FWB followed by the usual physio etc. The sort of approach you’ll read a lot about throughout this website. Throughout those 6 weeks there is absolutely no movement of the ankle, referred to in the report as non-mobilization. Groups in other trials studies were treated with a far more aggressive approach. FWB immediately……yep, straight away from surgery, FWB. I can’t quite imagine what that would feel like but that’s what they did. Still in the cast for 2 weeks, still the boot after that, but no crutches. FWB straight away…..madness right? These people were fixed in plantar flexion (toes pointing down) in the cast for 2 weeks but allowed mobilization after that. They could have up to 30 degrees of dorsi flexion (pulling your toes up) whilst having the boot on/off. After 6 weeks the boot came off. So, how does this play into my own recovery, I am currently 4 days into week 5. My surgeon made it clear to me the best advise is to listen to your body. If you go FWB, be prepared to take it easy to begin with, don’t just start walking everywhere thinking you can get back to normal everyday activities. I am FWB, ditched the crutches as soon I came out of seeing him. However, I am not going mad. Round the house is easy enough, and if it hurts I can sit down for a few minutes. No trips round the supermarket just yet. In my experience, the only part that actually hurts and bothers me is the actual wound site rather than the tendon itself. I am getting zero pain from actually inside my leg, it’s all on the surface. JUST TO BE CLEAR….when you are FWB you should always be doing it IN the boot. I have not had the all-clear to put my foot on the floor without my boot yet. I expect that to happen in the last week of August, my surgery +7 weeks. At that stage I’m going to put shoes on and get around the house. Something backless, Crocs maybe, so as to not rub on the scar. The more I read about this aggressive, accelerated approach, the more I am convinced it’s the right way. Speak to your surgeon but I would advise getting FWB as soon as you can. As long as you listen to your body and rest when it hurts, get on your feet, get weight through it. Walking in a boot is tricky, I’m not very good at it yet, but it feels great to be getting around without crutches. The other benefits are I’m using my legs properly so muscle atrophy should stop, my hips/shoulders/hamstring/hands aren’t aching from all the crutch work. The only bit that is sore is the ball of my foot, those wedges are hard, but if this shaves weeks off my recovery I can live with a sore foot. It’s been a very interesting few days though, as my consultant has changed the protocol I’m on for my recovery. I was on the standard recovery protocol where I would normally still be NWB for another 2 weeks (eugh). However my consultant has said that because there is no swelling, no bruising and no pain I have moved to an accelerated rehab protocol. So this means that I allowed to be PWB with 1 crutch….what a life changer! It was SO difficult at first to commit to lifting my good foot off the ground to put pressure through my injured leg. Knowing that as soon as you lift that foot off the ground you’re putting weight through your repair site is very daunting. At first I kind of dragged my good foot about an inch across the floor but eventually you just have to commit, push your repaired foot into the ground, grit your teeth and lift that good foot off the ground. And it was so great…. Within a few minutes I’m walking around the garden with just one crutch, Neil Armstrong’s voice in my ears! Happy days, it felt like such a huge leap forward in my recovery. It’s really important to have the crutch on the other side to your injury, so I have injured my right leg, the crutch is in my left hand and they move together, then the good foot moves forward. This has literally changed my life. It seems so simple but I can now carry things, pick things up, get something from the fridge, such simple tasks but things that make life so much easier. It does say that from week 3 onwards (I’m currently 1 day short of 4 weeks) that I can be FWB but that seems a step too far for me so I’m sticking with one crutch for now. There are a couple of other things it says that I am not doing. It says I can sleep out of the boot but I’m not going to for a couple of weeks yet. I’m so used to sleeping in the boot (leg elevated on pillows) that I may as well continue, why have it out of the boot and risk pain or re-injury? Also, I’m still bagging my wound for showering….I’m really not sure why tbh. I just don’t have confidence yet in getting my wound wet, probably a bit over protective but so be it. I also still sit on a stool to shower, there seems no point risking slipping over until I have more strength. Don’t rush these things…. So how does this change the next couple of months? Well, originally I was looking at being out of the boot and into shoes at around week 12-14 (first week October) but now I am looking at week 8-9 (end of August), that is a huge difference! So, how to get yourself into the accelerated protocol? Here are my 3 top tips! 1. Elevation, elevation, elevation. I literally had my foot up the entire time, unless I was using the bathroom. Bed, sofa, repeat. For 2 weeks. Man it’s dull but do your best to get through it as you will shave several weeks off your recovery. In my case it’s taken 4-6 weeks off! Thank you Netflix. 2. Rely on friends and family. Don’t be afraid to ask for help. I had someone make me a sandwich each day for lunch, simple things like that would take me 20-30 minutes in the kitchen which is time your leg would be down. 3. Sleep with your leg up for weeks on at least 2 pillows or a pile of towels. I’ve been doing it for 6 weeks now (since injury date) and the swelling had gone within a week of surgery. Get that leg up and keep it up! You might find your knee or hamstrings hurt when your leg is up so support that area too, and a rolled up towel between your knees when lying on your side helps loads. 4. Don’t be tempted to stretch that tendon when your boot is off. The urge to pull those toes back and watch the tendon move is huge. Keep that foot still until you are told to exercise. Trust your surgeon and physio experts. I have another consultant appointment on Saturday for assessment, hopefully another wedge removed and approval to start some serious physio! Greetings from the sofa in London! You’ll already be able to tell from the word ’sofa’ that I’m in the UK, sunny London to be precise. Full ATR playing cricket (Google it!) on June 17th 2017. I’m now 18 days post op and all going well so far. Had a the cast for 2 weeks and just got my boot at the weekend. Surgeon very happy with the wound, stitches out etc and start physio this week on day 20. Male, Nearly 40, relatively fit, runner, golfer, cricketer. I won’t rattle on about how I did it as you’ll all have read the same kind of thing hundreds of times, needless to say it popped, full rupture, it hurt and it got repaired by a surgeon two weeks later. I wanted to blog my recovery mainly for people that do their ATR playing cricket as there don’t seem to be many (if any) blogs about getting back on to the cricket pitch. I’m a wicketkeeper so that means squatting right down about 300-350 times a day on match days plus hundreds more times during the week. The pressure this puts on the achilles is huge, plus lots of explosive pushing off for running up and down the wicket, it’s a wonder it doesn’t happen more regularly. I’m in the ‘doing nothing’ stage which I find mind numbingly dull. I’m lucky that I can work from home so that keeps me busy plus we have just had Wimbledon so that made the days go faster. I would say the trickiest parts of recovery at the moment are firstly sleeping and secondly resisting temptation to stretch my heel around when the boot is off. Sleeping…..wow, that’s not east in this damn boot. My tips would be to take off the plastic front cover (you only really need that for protection during the day) and loosen the bottom two straps. Seems to work for me, plus I am carrying on with keeping my leg rested on 2 pillows at the end of the bed to keep the leg elevated above heart level. Sleeping like that for over a month now has definitely helped with swelling which has already gone just about completely. Temptation to stretch…..when the boot is off (heavenly!) I am constantly fighting the temptation to pull my toes back, push them forward. Doing nothing with it takes a lot of concentration. I have words of my surgeon ringing in my ears “you’ll be tempted to move it….DO NOTHING”……yes sir! I’m on 4 wedges at the moment, consultant fitted the boot with only 3 but that was agony on my achilles so he put another one in there. Going back in 2 weeks to be assessed and probably down to 2 or 3 wedges. I’m keen to start exercising it but resisting so far apart from PWB on 2 crutches up and down the sitting room. I can put a fair amount of weight on the foot so I’ll take that as a small victory. Looking forward to phyiso this week although it’s early days so we are mainly going to discuss the next 6 months, layout the protocol so I can start to set myself those targets. Atrophy…..my right calf muscle has all but turned to jelly I’m finding it hard to come to terms with that but not a great deal I can do about it. I live in a fairly idyllic village so can always find a good excuse to go for long walks, that’s my plan once given the go-ahead. On the lookout for an exercise bike too at the moment, seems like a sensible thing to do having read many blogs on here. I’ll update again in 2 weeks once had my next review with the surgeon. Good to know about the pool! I just re-ruptured mine and am trying to figure out how to best keep myself somewhat active. I’d actually never heard of healing long either, but it’s good to be aware of. Thanks for sharing the resources. This page is the best place to find all sorts of stuff! You are a rock star!! And thanks for the link. I’m 11 wks and found the pool to be an amazing help. My biggest challenge is my head…I’m over protective of my ankle. Yet I did walk my 1st mile on my 11 week rupture date. That was amazing!! At 9 weeks, I had been “walking” for only a week. I was on the 4 NWB & 4 CAM walker protocol. I’ve heard a little about “healing long” but haven’t found much in sites. I’m assuming that’s an overstretch of the tendon. I do toe raises before I walk because my calf/tendon stiffens easily/quickly still. Is that a bad thing? congrats!!!!!! have you tried to walk without shoes? It was hard for me, now I have a hard time finding a pair of shoes that doesn’t hurt/irritate my scar which is still sore. Congrats on losing the boot! Take SMALL steps to start walking more normally. As my PT guy says - it is most important to have good form! When I got out of the boot he said take the smallest step you need so that you can walk with a normal boot. When I started jumping on one foot he said HOLD ONTO THE WALL so that I could do the jump perfectly. As things got stronger I could just put a hand on the wall, then a finger on the wall and I’m still at the finger on the wall point. And walking in the pool is definitely a good thing. I did it too - walked forwards and backwards and sideways. Congratulations on losing the boot! I feel the same way at the gym. I stick to a few basic machines and look forward to the day when I can go back to outdoor activities for my exercise (running and tennis for me). I found pool walking to be very nice - mostly because it was a chance to walk somewhat normally with hardly any discomfort. You spend so much time being uncomfortable during recovery…the chance to feel nice and relaxed, and to walk semi-normally, is as helpful mentally as it is physically. At least, that’s how it went for me. Even now, 24 weeks after surgery, I look forward to going to the pool because I can almost forget that my leg still doesn’t feel right. The commitment to FWB has made a great change to everything. I’ve had two physio sessions, another one tomorrow, where I’m getting more and more exercises to do. I have 7 different exercises to do morning and night, takes about 15 minutes. They are all fairly classical I think….toe raises, pull toes back, minor heel raises although that one is next to impossible at the moment. The only tip is to only stretch to the point of resistance, which won’t be very far. Beyond that and you risk “healing long” which you will come to read a lot about. To be honest though, you’d have to be pretty dumb to stretch to the point of pain and heal long. The best news though is I’ve been given the all clear to get on the exercise bike. I had one delivered today, I’ve been on it already for 5 minutes and will do so again shorty. Just 5 minutes at a time on the lowest resistance but at least it’s something. Hey Andy how is it going? Looks like you guys are really active posting so I wanted to jump in. I ruptured my Achilles and had surgery March 21, 2017, stitches out and walking flat in boot on March 31, 2017. Doc had me walking without a boot on April 28, 2017. 3 more months have passed and progress is still steady.I guess I’m about week 17 or 18 and my life is back to normal. I’m 63 so normal is a lot different for me but I’m cutting firewood, built a deck and doing everything I want without a problem. I can go up and down stairs, even on my toes, but still can’t lift my weight on the toes of that foot. Doesn’t hurt, I just can’t do it. No swelling or pain but my darn heel is still pretty numb, probably from walking on it rather than on my toes. I’m non surgery route. My protocol was NWB for two weeks then move,move, move! As an avid runner…I have just been so excited to sweat. I’m progressing gradually though…aerobic activity now 30min every other day and no pressure on the aircast. Hard cast came off at exactly 6 weeks to the day. This rehabilitation specialist came along by pure chance (in conversation with a common acquaintance ). I started rehabilitation with him 3 days later. He was careful initially - it was only deep tissue massages and passive ROM in the beginning. His massages were magical. The immediate effect was incredible - the effect didn’t last long but each time it reverted to a slightly better condition than before. I remember after PT session #2 - just 5 days since cast came off - I came home and my wife even made a video of me walking because I practically did not limp. Next morning of course the tendon was back to its usual self and I would be limping for few more weeks. @zoomie at what week did you start therapy? Your progress is very impressive!!!! I’m at week 6 with boot on. I’m very afraid to put weight on my foot without the boot. I do start therapy the end of my week 7. We all should get to the finish line about the same. In 12 month we all will be back to normal activities and difference in strength between 2 legs will be academical. Regarding the journey to the finish line - I was questioning super conservative protocol in the beginning but looking back at it I can’t say that I am disappointed with the choice of my doctor. I could walk 2 miles in flip flops by week 8. (2 weeks after taking cast off). By week 10 my limp was almost not noticeable. I started jogging at Week 15 on the flat asphalt around my neighborhood. Its been exactly 2 weeks since I’ve started jogging (end of week 16) - the progress has been steady - jogging 3/4 of the mile under 6 minutes. Tomorrow will try to do 1 mile keeping it under 8 minutes. There is no pain or swelling after jogging. I am usually out of breath or my calf is tired but tendon is holding up (just as it should according to my doc). @sargegirl - Am I right to understand that you are rowing and on a static bike just two seeks post surgery? That’s amazing, I’m very jealous. I have physio next Wednesday but I’ll be nearly 6 weeks by then, hopefully given the all clear to do the same. Thanks for the long post Andy. Confirms everything I’ve been told about early movement. I do my exercises daily and have been so happy to add in cardio now with rowing, biking (both with only one leg strapped in) and pull buoy swimming! Those are all in my protocol after 2weeks. I’ve also found yoga a huge help to keep my ROM going and stretch out some of those compensating aches. Since mine wasn’t ATR but rather surgical cutting of the achilles to remove a bone spur my recovery is a bit different. I totally believe that the sooner you are FWB the less rehab you’ll need due to muscle atrophy. That is my biggest issue now - getting the strength and flexibility back in the calf/achilles. My doc had me doing ROM at 3 weeks which worked great for me. And, up until recently, I was seeing regular improvement in all aspects on a weekly basis. The improvement has slowed down a bit now - but hopefully with a change of running shoes and a slight tweak in my exercise pattern I’ll see more improvement. Everyone’s case is probably different as well as recovery protocols/results. Mine was super conservative - 6 weeks complete immobilization in the hard cast with No weight bearing. Went straight from hard cast into FWB in the shoes and no crutches same day cast came off. My tendon was so rigid it was stuck in negative 6 degrees of plantar flexion. Every step was a huge amount of pain. Apparently my doctor made a choice to sacrifice initial ROM for strength of repair. (At least according to him on the choice of protocol). He also told me that walking is the best therapy. And that after a surgery and 6 weeks in the cast unless I fall off the stairs I will not rerupture tendon again. Recovery is 6-12 month process and 3-4 month down the road initial treatment protocol is not as important as being persistent and keeping an eye on the ball. Hey Andy this is great news and I totally appreciate your long post! I have been FWB since week 3 when I got my staples removed and cast off. My surgeon put me in my boot and said FWB and wean myself off the crutches. I ditched my crutches by week 4. I go see my surgeon again next Monday which is week 7. I will keep you in the loop. So my scar actually hurts to. I was wondering what should my scar look like at week5. As my surgeon said I can not immerse my foot in water. I am only able to shower which mean I have Terrible dry skin. Hey Andy was anything said about what type of ROM and massaging the scar? Naturally movement would be AROM but as I said speak it all through with your surgeon and/or physio first. From the sofa, leg raised. Just to clarify, you have indicated up to 30 degree plantar flexion (pulling toes up). Pulling toes up is dorsi flexion. 30 degrees dorsi flexion would be difficult to achieve in a healthy tendon and impossible for a recently ruptured AT. Some people could read this to think they can push the tendon to this level which I feel could be harmful. There is no mention whether the ROM is active or passive and that will have considerable bearing. Passive ROM is dangerous in the early stages. I do agree with other aspects regarding early weight bearing and mobilization within this time frame. I appreciate the information you just shared. Thank you for the time and effort you put into researching this stuff. Today being the start of Week 2 of post-op, I’m going nuts from the inactivity. Needless to say, I’m anxious to get back to normal, but not at the expense of a setback. I’m willing to share this with my ortho guy next Tuesday to see what he thinks. But I’m up for the challenge. Hey Andy how are you? This is Ty from US (female 40 years old) I had a complete rupture of my right achillies on June 16, 2017 and had surgery June 20. I’m 5 weeks post op I think we are on the same week of recovery??? I noticed we are similar in age and date wow. So I had staples and cast removed at 3 weeks been in a boot since with 3 wedges. I removed my first wedge 3 days ago so now I’m down to 2 wedges. I’m FWB and don’t use crutches. I use them when I have my boot off. I don’t go back to surgeon for another 3 weeks. Did you start therapy already? I don’t start therapy until week 8. Do you put weight on your foot with out the boot on? An update for you on the jogging progress. Since I started jogging on July 19th - this seems like a distant era 11 days later. My first jog was between 0.1-0.2 miles, favoring my good leg during the jog and tendon getting tight at the end of it. The pace was 10.3 minute mile. I’ve been jogging every day for the last 11 days. Increasing the pace and distance every 3 days. Today (11 days after I started) - I ran 3/4 of the mile. Pushing strong with both legs - tendon felt normal (no pain or tightness). Pace was a more healthy 8 minute mile. I was out of breath at the end of it - but its a general conditioning vs a tendon issue. Per doctor’s advice I still run on the flat asphalt in my neighborhood, had not tried hills yet. I found this site several weeks ago, right when I blew out my left achilles tendon. I knew exactly what happened. The experiences everyone has shared has been extremely helpful and encouraging. Andy, noticed you injured yourself a day after I had my incident (6/16/17). However, you had your surgery on the 29th. Twelve days later. It took me nearly six weeks to finally have surgery (7/24/17). Since you’re the closest to me on this recovery timeline, I’ve thought it a good idea to kind of shadow you somewhat. Knowing full well each of us heal at a different rate and may require different therapy, it may help me have a general idea of what to look forward to. Keep up the good work. And maintain that positive outlook. Way to go! Keep at it! Definitely keeping things elevated as much as possible for the first 2-3 weeks is key. My doc had me do it for 3 weeks. Congrats on taking some one crutch steps! And moving into the accelerated protocol. From what I’ve read, that seems to be the way to go. I bet it won’t be long until only having one free hand is not enough and you move to crutch free walking! Keep up the great work! Hi Andy. Yes!! First step is so exciting!!! Congratulations on your progress! Today I did only 0.1 miles as the tendon started to tighten up. Doctor told me not to push it if feels uncomfortable. Hoping it will be better tomorrow. @andy - mine was surgery. Well It was a very slow jog at the pace of 10.3 minute mile. Doc told me I could try if it feels comfortable to do 0.2 miles for a week then try 0.4 for 2 weeks. I felt pumped up and nervous at the same time at the end of the run I wanted to go longer as ankle was holding up , luckily I held my horses. Only 15 weeks and you are jogging? Wow…..amazing! I bet you were nervous. Were you surgery or conservative care? I am so pumped up! Today is exactly 15 weeks since my ATR and I went for my first jog outside this morning total of the whooping 0.2 miles. Could not have imagined just 4 month back that running 0.2 miles will be so much anticipation and excitement. Ankle didn’t hurt during run and still feels normal. I keep feeling it out every so often holding my breath that it does not swell or start hurting. Andy I think your mega goal of jogging by Christmas is very doable. Only question - how far will you be able to jog. You are about 3 weeks ahead of me…only I’m the non-surgery route. I look forward to reading your posts so I know what is to come in my journey for this active girl across the pond in Canada! Good luck! Sounds like you have a good mindset for the recovery. For what it’s worth, everything got a lot better for me after the first 4-5 weeks. It’s tough being immobile early on. Those all seem very doable. I’m hoping to play in a soccer tournament in September - we’ll see I suspect it won’t be the achilles that keeps me out - but my fitness level! I won’t play with my team if I’m not an asset. Thanks for the support! I have 3 “Mega Goals” as I call them. 1. Play golf on my 40th (November)…..I reckon that’s an easy one to achieve. 2. Go for a run on Christmas Day. 3. Run a half marathon exactly a year post surgery, June 29th 2018. Maybe I’m aiming high, time will tell. Good luck Andy! I found sleeping to be incredibly difficult! Was so glad when I got the OK to not wear the night boot. You’re doing the right thing in following the docs orders and elevating. I got the OK at 3 weeks to do very simple ROM (forward backward and side to side) and that was it. But I was NWB for 6 full weeks due to my surgery. And yes the calf atrophies very fast (use it or lose it has a new meaning to me now!) and takes a long time to get back. I’m at 5 months now and am still working on it. Still don’t have the flexibility and strength of my good foot. And now the progress isn’t seen weekly either so I have to work harder to motivate myself - LOL! You go from daily progress to weekly progress to ??? Although I did move from jogging .25 mile to jogging .5 mile and will try for .75 mile in a couple of days. So I guess that is also progress - but I HATE jogging! Keep being patient! andyfrancis’s AchillesBlog is proudly powered by WordPress and WPDesigner..